This time of year, home gardeners are usually getting a beautiful crop of ripe garden tomatoes and non-home gardeners are getting a great deal on fresh tomatoes at the store. Either way, it’s tomato season! The things I love making most with great tomatoes are salsa and tomato sauce. 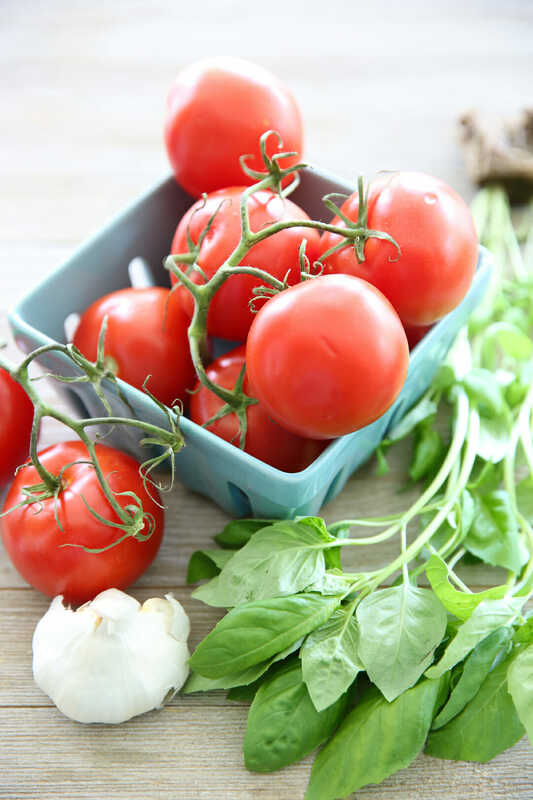 I’ve shared my Roasted Garden Tomato Sauce recipe and it is SUPER popular around here, but I have another one for you today! 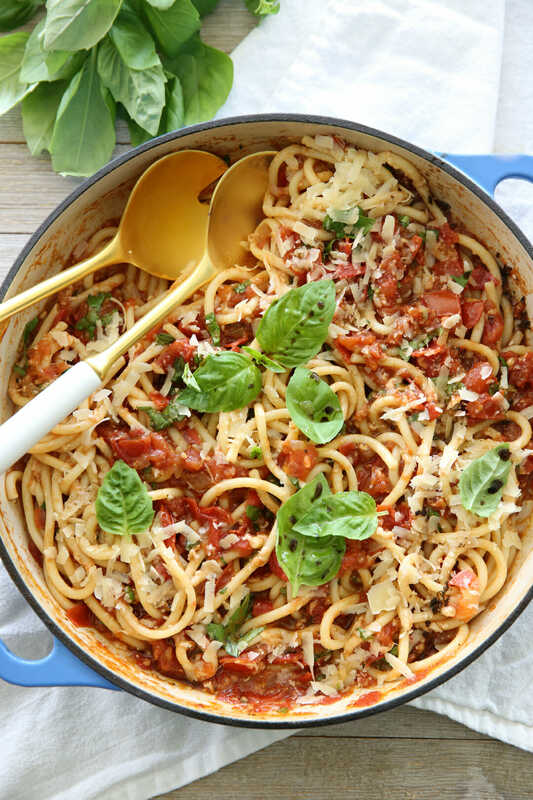 This recipe for Fresh Tomato-Basil Pasta is everything that’s great about summer and SO simple. 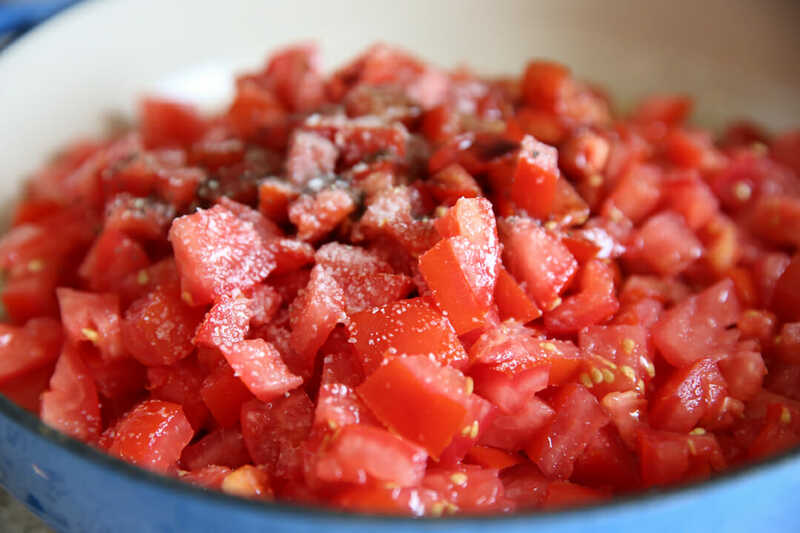 Fresh chopped tomatoes are simmered with garlic and onion and just a touch of simple seasoning (salt, pepper, pinch of sugar, balsamic vinegar) and simmered until a thick glorious sauce emerges. 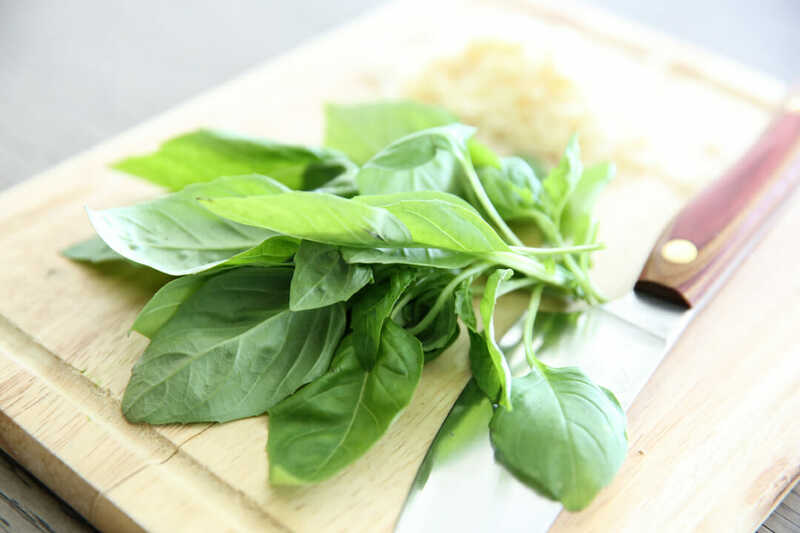 Toss it in with hot pasta, fresh Parm and plenty of basil and it is seriously heaven on a plate. The smell of garlic and onions sautéing in olive oil on the stovetop will forever be one of my favorite smells. Speaking of stove tops, this is one of my most favorite pans, (a gift from Kate a few years back) . I use it ALL the time! You don’t have to be fancy about chopping because these tomatoes will break down. You don’t need any additional liquid- tomatoes go right in the pan with those onions and garlic and then you’ll simmer away for 45-60 minutes. I realize that might seem like forever to some people, but it’s pretty hands-off. Just pass by every one and a while and give it a good stir and it will just sit there and do it’s thing. The longer it cooks, the thicker your sauce will be. I was so excited to eat this batch that I didn’t take a picture of the final sauce after cooking! But when it gets close to being done, I boil some pasta and grate some parmesan cheese. 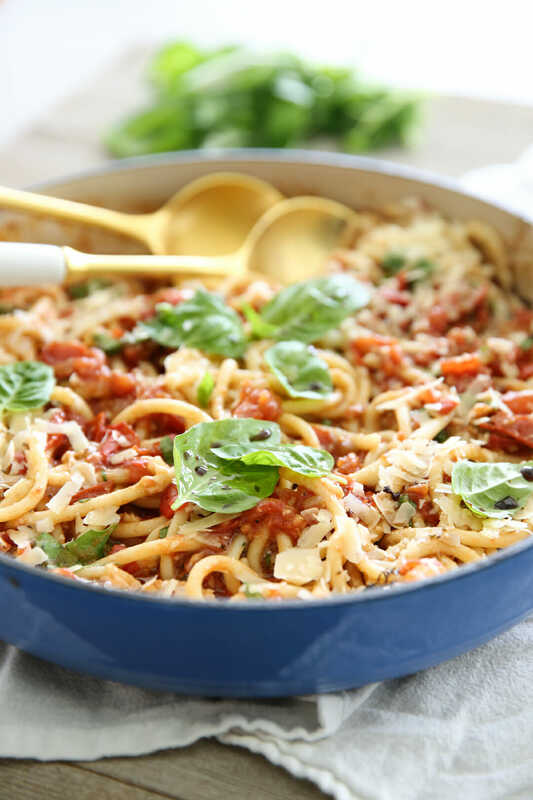 The pasta gets put right into the sauce pan and then you can toss it all together with the basil and parm. I always drizzle mine with a little bit of Olive Oil at the end- Dipping Oil is actually my favorite, you can find it here! And then serve it asap. It’s comfort food at its best. This recipe originally appeared in our Savoring the Seasons Cook Book, which you can find here! Fresh Tomatoes and Basil come together in a simple homemade sauce that is comfort food at its best! This recipe originally appeared in our Savoring the Seasons Cook Book. Find it, here! Heat a large skillet to medium heat. When hot, add oil to coat pan. Add onion and garlic and saute, stirring frequently, until onion is tender (about 4-5 minutes). Add tomatoes, salt, pepper, vinegar, and sugar. Stir gently, breaking up tomatoes with a back of a spoon a bit until they release some juices and come to a simmer. Simmer about 45 minutes, uncovered, stirring periodically until reduced and thickened. 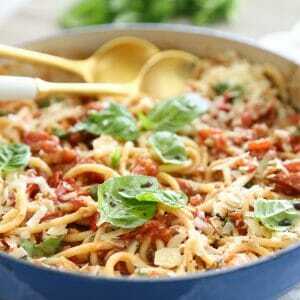 Remove from heat and stir in basil and parmesan, toss with pasta and top with additional parmesan if desired. As you are chopping your tomatoes, squeeze out the inside “juice” (pulp and seeds) so your sauce doesn’t contain too much liquid. 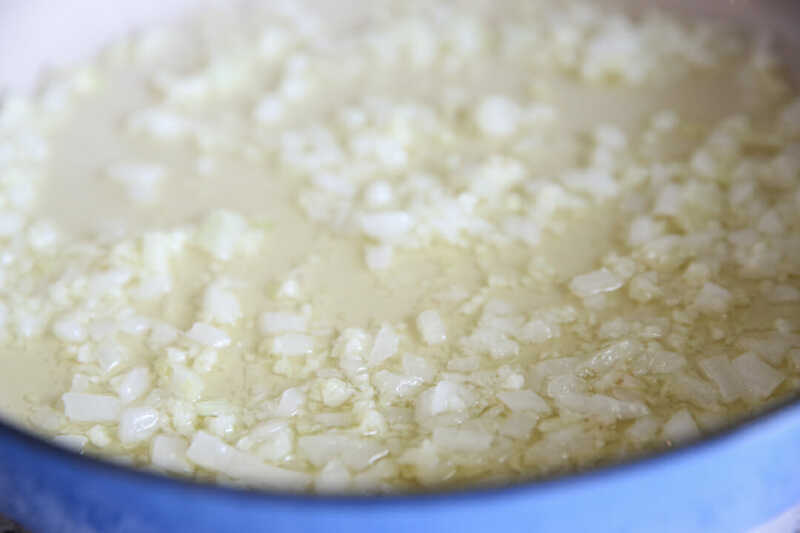 If you would like your sauce to be thicker, simply simmer longer. Would this work for cherry tomatoes too? I have SO many of those! Ya I think it would- it will just be heavier on the little bits of skins- I would maybe just cut them in half. Let me know how it turns out! This looks so good and perfect for summer with all those fresh, garden ready ingredients! You have me sold! I can’t wait to make this! Haha, no I don’t have a pan just for photos- I cook with this one all the time! Mine washes clean really well. If I ever have tough spots, magic eraser usually does the trick! The things I love making most with great tomatoes are salsa and tomato sauce. I love to add tomato in my almost every dishes because it makes the food yummy and tasty. So glad I found this today, Ihave so many tomatoes! Can you freeze this?? Yes, I think you could freeze it! Are Plum tomatoes similair enough to Roma tomatoes that I could use Romas instead? Yes, you could definitely use Romas! What do you think about tossing this with zucchini noodles? Should I saute them first? Will it make the sauce too watery? It’s delicious! They just need a quick saute to take the bite out them but not so much it makes them limp. Only takes a few minutes. Thanks for replying, I’ll try it! I use this recipe & cook chicken on the grill & lay slices on top of dish. I made this today with some tomatoes my neighbors brought over from their garden and it is delicious!